The Gweagal (also spelt Gwiyagal) are a clan of the Dharawal tribe of Indigenous Australians[a] Their descendants are traditional custodians of the southern geographic areas of Sydney, New South Wales, Australia. The Gweagal Aborigines are the guardians of the sacred white clay pits in their territory, which are considered sacred. Historically clay was used to line the base of their canoes so they could light fires, and also as a white body paint, (as witnessed by Captain James Cook). Colour was added to the clay using berries, which produced a brightly coloured paint that was used in ceremonies. It was also eaten as a medicine, an antacid. Geebungs and other local berries were mixed in the clay. Naturally forming and human-modified caves or hanging rock shelters were regularly utilised by the first Australians during walkabout – seaonally guided maintenance of land and the vast natural gardens routinely tended by the Aboriginal people. In the Royal National Park some of the caves were used as burial sites. In tribal lands and Dreamtime places this cultural practice continues. Charles Sturt documented large stone dwellings consisting of four rooms or more, along the banks of the Murray river and the shores of lake Victoria. These buildings were re-purposed by invaders, colonists and settlers in the early years of colonisation, the foundations of many such buildings can be seen in archaeological sites around Australia. Caves and shelters are located in various places along the George's River, which over the years have eroded into the sandstone cliffs. There is a large cave located in Peakhurst with its ceiling blackened from smoke. There are caves located around Evatt Park, Lugarno with oyster shells ground into the cave floor. A cave has also been discovered near a Baptist church in Lugarno, and another near Margaret Crescent, Lugarno (now destroyed by development), it was found to contain ochre and a spear head on the floor of the cave when it was excavated. Another cave exists on Mickey's Point, Padstow, which was named after a local Aborigine. Australia's First Nation people decorated their caves and homes with carvings, sculpture, beads, paintings, drawings and etchings using white, red and other colored earth, clay or charcoal. Symbols such as "water well" with a red ochre hand directed newcomers to wells and water storage. Footprints on a line signalled that there were stairs or steps in the area. The dwellings boasted thermal mass unlike modern day housing, which kept an even temperature year-round. Rugs, furs and woven mats provided further warmth and comfort. Fire was used to cook, produce materials and keep their shelters warm. The territory of the Gweagal had much to offer. The Georges River provided fish and oysters. Various small creeks, most of which are now covered drains, provided fresh water. Men and women fished in canoes or from the shore using barbed spears and fishing lines with hooks that were crafted from crescent-shaped pieces of shell. Waterfowl could be caught in the swamplands near Towra Point and the variety of soils supported a variety of edible and medicinal plants. Birds and their eggs, possums, wallabies and goannas were also a part of their staple diet. The abundant food source meant that these natives were less nomadic than those of Outback Australia. Middens have been found all the way along tidal sections of the Georges River where shells, fish bones, and other waste products have been thrown into heaps. This, as well as environmental modifications such as dams, building foundations, large earthen excavations and wells, gives evidence of where Aborigines established villages for long periods, and are found where oysters, fresh water, and strategic views come together. Middens have been found in Oatley, and Oatley Point was known as a feasting ground. In Lugarno a midden is still existent and may be found in Lime Kiln Bay. The Gweagal Aborigines made first visual contact with James Cook and other Europeans, on the 29 April 1770 in the area which is now "Captain Cooks Landing Place Reserve", Kurnell, on the shores of Botany Bay. It was the first attempt made, on Captain Cook's first voyage, in the Endeavour, to make contact with the indigenous people of Australia. In sailing into the bay they had noted 2 Gweagal men posted on the rocks, brandishing spears and fighting sticks, and a group of four too intent on fishing to pay much attention to the ship's passage. Using a telescope as they lay offshore, approximately a kilometer from an encampment consisting of 6-8 gunyahs. Sir Joseph Banks recorded observing an elderly woman come out of the bush, with at first three children in tow, then another three, and lit a fire. Wile busying herself, she looked at the ship at anchor without showing any perplexity. She was joined by the four fishermen, who brought their catch to be cooked. After an hour and a half, Cook, Banks, Daniel Solander and Tupaia, together with 30 of the crew, made for the beach, only to be threatened by two warriors. They threw some gifts on shore, trying to get over the idea they had come to seek freshwater, but the Gweagal men reacted with hostile diffidence. Cook felt it necessary to encourage a change of attitude by shooting one of the men in the leg with light shot. Unperturbed, the wounded man retrieved a shield from a gunyah before returning. By that time the crew had already beached their boat. The sailors then proceeded to walk onto the beach and up to an encampment. Both Cook and Banks tried, with great difficulty, to make contact with the local people but without success due to the Aborigines avoiding contact after the first encounter, they simply went about their daily affairs seeming to ignore the strangers; they fished from canoes, cooked shellfish on the shore, walked along the beach, but at the same time, watched Cook's crew with caution. In 1770, after returning to England from their voyage in the South Pacific, Cook and Banks brought with them a large collection of flora and fauna, along with cultural artifacts from their most recent venture. The find included a collection of roughly fifty Australian Aboriginal spears that belonging to by the Gweagal people. Banks was convinced the spears were abandoned (on the shores of Kurnell) and "thought it no improper measure to take with them all the lances which they could find, somewhere between 40 or 50". Four of those spears – the only material reminders of the first meeting between Aborigines and Englishmen on the east coast still exist: two bone-tipped three-pronged spears (mooting), one bone-tipped four-pronged spear (calarr) and a shaft with a single hardwood head. Cook gave the spears to his patron, John Montagu, First Lord of the Admiralty and Fourth Earl of Sandwich, who then gave them, to his alma mater Trinity College. Archaeologists quote them as being priceless, as the spears are among the few remaining artefacts that can be traced back to Cook's first voyage. Although the spears remain in the ownership of Trinity, they are now on display at the Museum of Archaeology and Anthropology of Cambridge University in England. Biddy Giles (Biyarrung)(b.1820-died ca 1890s) was a Gweagal woman who lived throughout her life on traditional Gweagal land, and frequently impressed whites who employed her as a guide by her profound knowledge of the botany and landscape. She was a fluent Dharawal speaker. Rodney Kelly (born 1977) is a Gweagal activist campaigning for the return of the Gweagal Shield held by the British Museum, as well as other Gweagal artifacts in museums across Europe and Australia. Wikimedia Commons has media related to Australian Aborigines. ^ Norman Tindale thought they were part of the Eora. ^ a b Lawrence 1999, p. 2. ^ Goodall & Cadzow 2009, p. 31. ^ Tindale 1974, p. 128. ^ Goodall & Cadzow 2009, p. 87. ^ a b Turbet 2011, p. 9. ^ Turbet 2011, pp. 9–10. ^ Turbet 2011, p. 10. ^ Goodall & Cadzow 2009, pp. 80–108. Daley, Paul (24 September 2016). "The Gweagal shield and the fight to change the British Museum's attitude to seized artefacts". The Guardian. Goodall, Heather; Cadzow, Allison (2009). Rivers and Resilience: Aboriginal People on Sydney's Georges River. University of New South Wales Press. ISBN 978-1-921-41074-1. Lawrence, Joan (1999). A Pictorial History of Canterbury Bankstown. Kingsclear Books. ISBN 978-0-908-27255-6. Malvern, Jack (8 December 2018). "250 years on, Captain James Cook's foes want their shield back". The Times. ISSN 0140-0460. Retrieved 29 March 2019. McKenna, Mark (2018). Moment of Truth: History and Australia's Future. Quarterly Essay 69. Black. ISBN 978-1-743-82037-7. "Once were warriors". The Sydney Morning Herald. 11 November 2002. Tindale, Norman Barnett (1974). 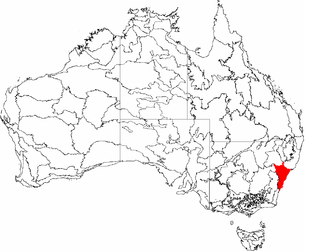 "Eora (NSW)". Aboriginal Tribes of Australia: Their Terrain, Environmental Controls, Distribution, Limits, and Proper Names. Australian National University. Turbet, Peter (2011). The First Frontier. Rosenberg Publishing. ISBN 978-1-922-01300-2. The Kamay Botany Bay National Park is a heritage-listed protected national park that is located in the Sydney metropolitan region of New South Wales, in eastern Australia. The 456-hectare (1,130-acre) national park is situated approximately 16 kilometres (9.9 mi) south-east of the Sydney central business district, on the northern and southern headlands of Botany Bay. The northern headland is at La Perouse and the southern headland is at Kurnell. The Darug are a group descending from an indigenous Australian people of that name, which shares strong ties of kinship and, in pre-colonial times, survived as skilled hunters in family groups or clans scattered throughout much of what is modern-day Sydney. The Wangal people were a clan of the Eora Aboriginal people whose heirs are custodians of the lands and waters of the current Municipality of Strathfield and surrounding areas of Sydney, New South Wales. The Eora (Yura) are an indigenous Australian people of New South Wales. Eora is the name given by the earliest settlers to a group of indigenous people belonging to the clans along the coastal area of what is now known as the Sydney basin, in New South Wales, Australia. Contact with the first white settlement's bridgehead into Australia quickly devastated much of the population through epidemics of smallpox and other diseases. Their descendants live on, though their languages, social system, way of life and traditions are mostly lost. Kurnell is a suburb in Sydney, in the state of New South Wales, Australia. It is 21.4 kilometres (13.3 mi) south of the Sydney central business district, in the local government area of the Sutherland Shire along the east coast. Cronulla and Woolooware are the only adjacent suburbs. La Perouse is located opposite, on the northern headland of Botany Bay. The Cronulla sand dunes is on the south eastern headland of Botany Bay. The eastern side of the peninsula is part of Botany Bay National Park, and Towra Point Nature Reserve is located on the western side of the suburb. Kangaroo Point is a tiny suburb in southern Sydney, in the state of New South Wales, Australia. It is 22 kilometres south of the Sydney central business district in the local government area of the Sutherland Shire. The Hacking River is a watercourse that is located in the Southern Sydney region of New South Wales in Australia. The river is named in honour of Henry Hacking, a pilot at Port Jackson in colonial New South Wales. A woomera is a wooden Australian Aboriginal spear-throwing device. Similar to an atlatl, it serves as an extension of the human arm, enabling a spear to travel at a greater speed and force than possible with only the arm. The Cronulla sand dunes, also known officially as the Cronulla Sand Dune and Wanda Beach Coastal Landscape, are a heritage-listed former sand mining, film making, pastoral property and visitor attraction and now nature conservation, open space and visitor attraction located on the Kurnell Peninsula at Lindum Road, Kurnell in the Sutherland Shire local government area of New South Wales, Australia. It is also known as Part of Kurnell Peninsula Headland and Cronulla Sand Hill. It was added to the New South Wales State Heritage Register on 26 September 2003. Boat Harbour is a small beach located on the north-eastern side of the Kurnell Peninsula in Sydney, Australia. The Australian frontier wars is a term applied by some historians to violent conflicts between Indigenous Australians and white settlers during the British colonisation of Australia. The first fighting took place several months after the landing of the First Fleet in January 1788 and the last clashes occurred in the early 20th century, as late as 1934. An estimated 20,000 Indigenous Australians and between 2,000 and 2,500 settlers died in the wars. However, recent scholarship on the frontier wars in what is now the state of Queensland indicates that Indigenous fatalities may have been significantly higher. Indeed, while battles and massacres occurred in a number of locations across Australia, they were particularly bloody in Queensland, owing to its comparatively larger pre-contact Indigenous population.